The third Flash Annual wasn’t even an annual coming pretty quickly on the heels of the previous Flash collection. They just called it an 80 Page Giant. Fair enough, I’ll stop calling them summer annuals. Whatever it was, it did offer me my first look at three stories that preceded my “awakening” which were always fun to come across. 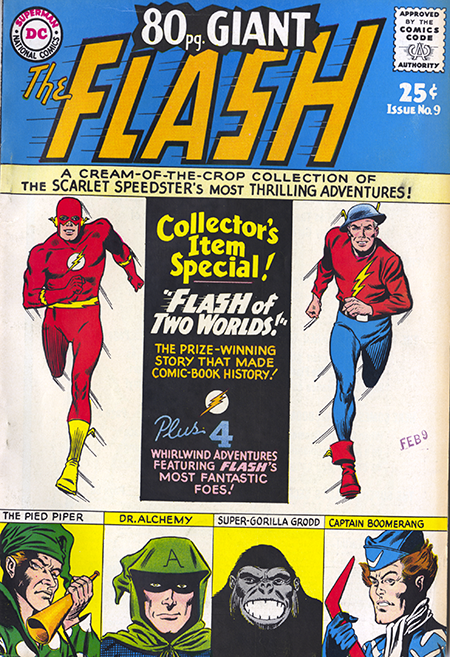 It also chose to reprint #123’s The Flash of Two Worlds which was nice to have just in case I lost the original issue, which wasn’t gonna happen. All of my other comics had gone on a shelf in a cabinet in my bedroom, but my Flash issues went into a special box. It was a box that had contained copies of Robert Lewis Stevenson stories that my dad had ordered as a kid. I had removed the books so that I could use it to store the comics which my dad had eschewed when I first wanted to buy them. Make of that what you will you Freudians out there.